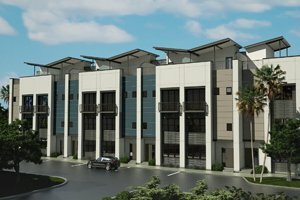 The Artisan on Main is a development of boutique townhouses which broke ground in late 2016 in a convenient location just east of central downtown Sarasota. The address of this property is listed as 41 North School Avenue, a road corridor on Artisan’s eastern periphery. Main Street, whose westward stretch hosts a slew of luxury Sarasota condos for sale, borders Artisan to the south. Tampa-based ICON Residential is the developer of the Artisan and a similar infill residential project at the Rosemary District—Valencia at Rosemary Place. Also operating in New York and Atlanta, ICON is bringing in to Sarasota many years of experience in the New Urbanist design principles that local authorities have adopted for the city in recent years. This developer’s modern and innovative approach to architecture, design and planning is evident in its rendition of the Artisan on Main. Its townhomes have been meticulously set to blend in with their active urban setting, with the residents provided with the best opportunity to enjoy a live–work–play environment. The Artisan condos for sale have been masterfully laid out for their residents to have convenient access to Main Street and School Avenue as well as to the strategic Fruitville Road and Audubon Place respectively north and west of this development. ICON likewise expertly platted the property’s parcel for a cluster of seven buildings three stories tall to accommodate a total of 37 exquisitely designed townhouses. Prospective buyers have five unique floor plans to choose from at the Artisan on Main. The picks on these designs range from 1,800 square feet to 2,700 square feet featuring three bedrooms, options which could fit varying residential needs and lifestyles. Pricing for these residences start from the $400s and top at around the $600s. 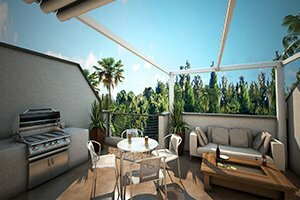 The distinctive features of Artisan townhomes for sale include private rooftop terraces or balconies. Select floor plans also offer optional elevators, plus customizable fixtures and designer upgrades throughout. Each townhouse at the Artisan on Main further exudes style, modernity and quality with their solid surface countertops paired with stainless steel appliances and Italian cabinetry. The utmost in livability and comfort are extended as well to these residences by their concrete block insulated construction, impact-resistant windows and spacious 10-foot ceilings. With these enticing features, the Artisan townhouses for sale were launched for pre-selling sometime in the first half of 2017. The market response has been quite positive, with seven of the residences in this development promptly pre-sold following their launch. The reasonable pricing and superb features of its townhouses combine with the Artisan’s convenient location in drawing its first buyers. These early birds no doubt took note of the townhouses’ proximity to many of downtown Sarasota’s attractions, such as the shops and restaurants on Main Street and its arterial roads. As easily accessible from the Artisan too are cultural venues like the Ringling Museum of Art and the Van Wezel Performing Arts Hall. 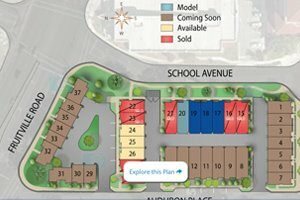 Additional amenities are also rising soon in the townhouses’ east downtown area, with the city having approved the makeover of the Ringling Shopping Center there as a mixed-use development. Below are the current real estate listings available at The Artisan on Main.